A Review of ‘Local Food: how to make it happen in your community’ by Tamzin Pinkerton and Rob Hopkins. Green Books 2009. By James Howard. There are some people that aren’t that fussed about food. To them it is merely functional, a fuel that keeps them going that appears in a package or on their plate, and very little time or thought is given to it. I cannot begin to understand that mindset. Food is so much more than merely an energy source – it is often a highly sensuous experience, full of variety and the focal point for wonderful social bonding in many forms. Yes, I love food, always thinking about my next meal and who I will enjoy it with. And yet food is, ultimately, an energy source, vital for human survival. Without treading on the toes of Pinkerton & Hopkins, this essential energy source for our very existence is now largely experienced at the end of a long process requiring the input of unsustainable amounts of fossil fuels that damages the stability of the climate that we require to grow the food! 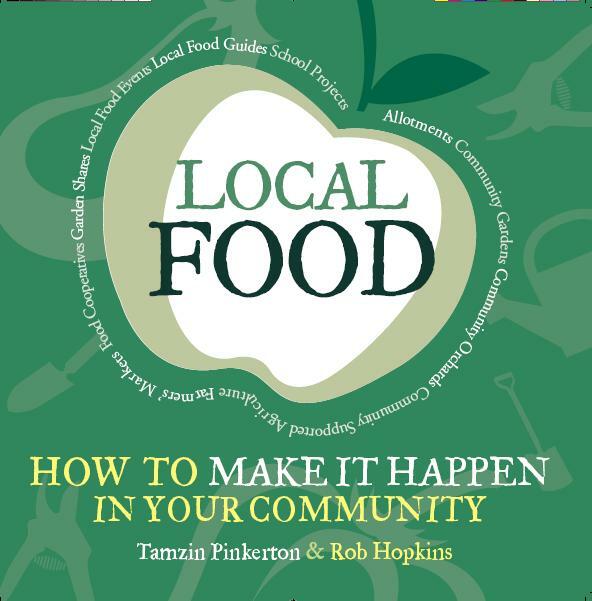 Of solutions offered, re-localisation of food supply is the only sustainable one, and thus explored in the very useful book “Local Food – How to make it happen in your community” by Tamzin Pinkerton and Rob Hopkins. Local Food is the first book to go into deeper detail following the previous Transition Books which offered more general views. The Transition movement is all about positivity, and it is incredibly positive for people, for groups, for communities, to begin to take control of how their food is supplied, where from, and how it is grown. One of the successes of this book is that it shows that there are so many ways to reconnect with local food, and in so many forms, that there isn’t any excuse really left for not making some step towards local food! As a long-time vegetarian who is supplied via an organic box scheme and buys local/seasonal food if forced into a supermarket, this book showed me that there is so much more I could do. There is no one-size fits all solution to local food, but Tamzin Pinkerton has provided enough shapes for all to fit into. There is much to like about this book. Each chapter is dedicated to different approaches to local food, from garden shares to food coops to food directories – many complementary. Each chapter follows a similar comprehensive format – an overview of the method, guest commentary, several case studies, then tips and further resources. It doesn’t tell you precisely what to do, but it tells you what you can do and gives you the metaphorical seed and (organic) fertiliser to find out for yourself how to do it. As a handbook for anyone wanting to get a local food project off the ground, this is a valuable resource, providing many ideas and inspiration. It is also heartening to see examples of projects up and running, filled with people who love food, and love it local. The numerous benefits of locally sourced food are also covered in the book and don’t need repeating by me here. The Transition movement has been about collaboration and also collection/distribution of information and this feels like a report on the collected learning of the Transition movement so far. Yes, much of what is in here could be found through research, but why do that when it is all in one place already? This book knows what it wants to achieve, and it achieves it admirably. It does not, for example, try to address agricultural policy. It does not ask too many questions about land ownership, which I think is going to be a very interesting aspect of the future dynamic between food production and employment (or neo-serfdom as it may be!). Nor does the book try to be too speculative – it deals with what you can do here and now to deal with the very foreseeable impacts of declining fossil fuel supplies. Having said that, there is a missing piece that I’d like to see discussed further – local energy sources for cooking and storing food. Clean water supplies are also something that are taken very much for granted and although possibly out of the remit of this book for now, water is integral to the whole process. ‘Local Food’ by Tamzin Pinkerton will be enjoyed by Transition groups and anyone looking to start a local food project. I would also hope that it is read by many beyond that constituency, perhaps by people in various levels of officialdom who may help rather than hinder the essential and speedy transition to local food. There are many recipe books out there and Local Food is a recipe book, not of food, but of local food solutions. Let’s get cooking! Review by James Howard, PowerSwitch.org.uk and LocalPower.org.uk, a website connecting local groups in communities. You can order ‘Local Food’ here. I’m looking forward to receiving my copy, but as James Howard mentions it, I’d like to say that I share his concerns about clean, fresh water. Here in Wales, one wouldn’t think that water could become scarce, but as I write this, I’m looking at the jerrycans with mains water collected from a friend’s house sitting here in my kitchen, again. We rely on a natural spring for our household’s water and after a very dry September, it has run dry, again. We had weeks without water this spring. Summer (as usual in Wales)was no problem, but now again (in autumn! )we have no water. This is a spring which has provided water for a busy farm for over a hundred years and never once ran dry until a few years ago. I now that other, once reliable, natural springs in the area, now regularly run dry. If this is what climate change means for coastal west Wales, I dread to think what’s in store waterwise for the south of England. We can’t grow our food, no matter how local, without regular rainfall, it’s as simple as that! Thanks for great review. Thanks also for that comment about water in Wales – this is deeply concerning. Thanks for alert. I wonder about springs as a water-source even here in Wales where it’s been a very wet summer. Is it possibly the case that a spring-fed household worked 100 years ago and doesn’t now simply because our 21st/late 20th century lifestyles mean that we use much more water per capita per day?